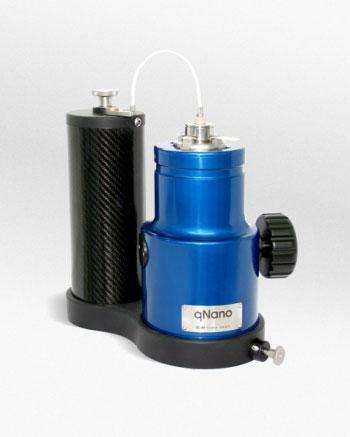 Nanotechnology instrument manufacturer Izon Science (www.izon.com) has released the first commercially available method to simultaneously measure the charge and size of nano- and submicron particles on a particle by particle basis. This innovative high resolution analysis developed for Izon’s qNano platform will provide researchers with a new tool to better understand and advance their work in a range of fields, including drug delivery, diagnostics and exosomes and microvesicles. Researchers working in the field of nanoparticle and liposome based drug delivery will find particular interest and benefits from Izon’s new analysis capability. This is because the therapeutic delivery efficacy, circulation time, effluent pathway, localized accumulation, cellular uptake, drug release profile and potential toxicity of drug delivery particles is mainly dependent on their size, charge, and concentration. The Izon qNano now provides the ability to accurately measure all of these properties. The new method measures the electrophoretic mobility of each particle as it traverses Izon’s tunable elastic pore. Very fine pressure control, via a new Variable Pressure Module (VPM), is used to regulate and optimize the forces acting on the particles, improving the accuracy of zeta-potential measurements. Izon’s new methodology also allows particle size to be analyzed at the same time, enabling, for the first time, an accurate measurement of both particle charge (zeta-potential) and size distribution. As individual particles are measured and counted, the numbers of particles for each charge and size fraction are also reported. This newly available method of simultaneously measuring both the charge and size of individual particles offers much higher resolution for particle characterization than existing techniques, which are generally limited to measuring the average of either but not both properties at once. The qNano’s ability to accurately measure the charge and size distribution and number distribution of particle systems is likely to become essential for nanomedicine researchers wanting to gain regulatory approvals for medical use. A beta version of the method was presented and discussed at the recent Izon Micro- and Nano-particle research symposium held at Izon’s new European headquarters at the Oxford Science Park. The new method is available through a modular hardware and software upgrade for existing users, or as a standard feature, which comes with Izon’s qNano particle analysis system. FIGURE 1. Izon’s new Variable Pressure Module (VPM) and qNano System enables particle-by-particle assessment of size, charge and concentration. FIGURE 2. Izon’s new method enables researchers to simultaneously measure the charge and size of individual particles from the resistive pulse signal they generate when passing through Izon’s elastic, size-tunable, pore sensor. The unique advantage of the technique is that it can be applied to accurately measure polydisperse or complex multi-modal suspensions composed of particle sets with different size and charge, which was not possible before.